The VEEMUX� Audio/Video Matrix Switch routes audio and video inputs from many video sources to multiple displays (projectors, monitors, etc.) and speakers via inexpensive CAT5/5e/6 cable. 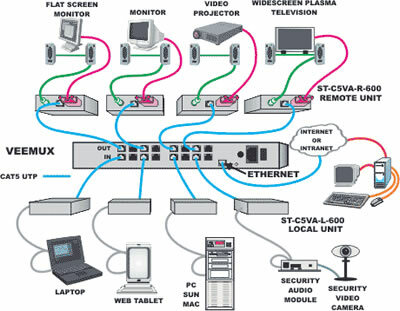 It is capable of connecting to as many as 16 video input sources via transmitters and 48 video ouput displays via receivers with a maximum extension of 1,000 feet between the transmitters and receivers. In addition to the remote inputs/outputs, the switch features one direct-connect VGA and stereo audio input/output for every 16 remote RJ45 connectors. Configure and control the switch through Ethernet, serial port, front panel buttons, or Infrared remote control. Supports resolutions up to 2048x1536 using NTI's 1,000' extenders and 1920x1440 using NTI's 600' extenders. A digital VU-meter shows the audio levels of the selected input. No loss of audio or video quality between the transmitters and receivers. VGA, S-Video and HDTV transmitters and receivers can be supported on the same VEEMUX unit. VGA inputs only work with VGA outputs, S-Video inputs only work with S-Video outputs, and HDTV component video inputs only work with HDTV component video outputs. The 1,000' transmitters will work with 600' receivers, and vice versa. The maximum extension is 600 feet between the transmitter and receiver. For resolutions at different lengths, refer to the 600' extender resolution chart. The VGA video from units with audio and/or RS232 can be routed to each other and to video-only units. Use the DIP switch to select between the direct-connect input or remote RJ45 input for port 16, 32, 48 and 64. One direct-connect output connector for every 16 RJ45 connectors. Total harmonic distortion + noise: 0.01% at 1kHz.